Yep, having friends in Crafty places does have it's benefits. Before it went to print I was lucky enough to see PDF sneaky peeks of Amy's Style Stitches book. Amy told me that she & David had so much fun styling the book - getting the look just right and creating the lush photography (David is not only the book's photographer, he is also the rock drummer for Black Owls - which is so cool it's sick!) I think the fact that Amy & David were in charge of the art direction of Style Stitches makes it very special and personal. It sure helps explain why it's so beautiful to look at! Flicking through the pretty pages is pure inspiration & escapism, but at the same time you can see how joyful and fun Mr & Mrs Butler™ photo shoots must be to create and take part in! So the crafty treat I have in store for you is a whole bunch of dreamy Amy Butler goodness. Check this lot out! Up for crafty grabs is a signed copy of Amy's new book; Style Stitches; the new & lush-ush Sandlewood Jacket pattern and new & cutie Honey Bun Poufs pattern. Yummy-yum yum! The Honeybun Poufs are just great for showing off your fave fabrics and putting your self/feet/tea & cake/children on. This is one of my fave designs. It a kitchen sink of bag, but so so stylishy so. I love that this craft book is just so pretty. There's loads of lush photography to inspire you and give you ideas for different fabric and colour combos. This is another fave design. I saw it in the flesh at the Quilt Festival and it looks like something you could have picked up a chi-chi boutique! At the back there are full-sized patterns on decent quality paper. Find more sneaky peek book pics in my Facebook. ☜ Click to see my U-Handbag Facebook page. I will send a signed copy of Style Stitches and the 2 sewing patterns to 1 winner. The draw is open to everyone. If winners are overseas I will mark the package as a 'gift' so there will be no customs to pay. I'll randomly select 1 winner in a weeks time: 13th Oct and announce them the following day-ish. Good luck! Question: What is cooler than scoring a new craft book? Answer: Having the author of said book deliver it to you by hand! Blurry iPhone pic of Melissa Averinos (fabric designer, author and owner of Yummy Goods in Cape Cod) and yours (toothly) truly. Melissa and her pal Beth were visiting London last week so we hooked up for a CCCC (coffee, cake & craft chat). Melissa was darling enough to gift me her book - Small Stash Sewing some sugar snap fabric, notebooks, lip balm and cupcake mints. Heh heh - ace crafty goodie bag! 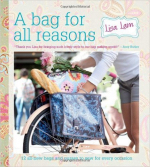 The book full of projects that are based around the use of fabric fat quarters. Fans of Melissa's blog will be delighted to find that the book reads much like her cosy & chatty blog. The projects are also very Melissa style too - whimsical and fun, but also practical. Tell you what, one of the best perks of my job is meeting and chatting with other crafters. Love it! Melissa's book is as colourful, fun and warm hearted as she is. I really dig it when in craft books the author's voice shines through. It's like having a buddy sew by your side. A bag - gotta have a bag! Here is a simple but striking way to use up a fave fat quarter with a bold solid colour fabric. I'm not yet quilt initiated. Perhaps I don't have the time or patience, but this quilt looks utterly gorgeous and yet it's very simple to construct (so I'm in!) The clouds are such a cute and cheeky idea. The instructions are clear and easy to follow. There are plenty of clear diagrams inside the book. This piece-it-together apron will make a fabbo pressie for yourself or a foodie friend. This very cute dress fits 2 - 6 years (yep you read right). Your darling gal can wear it firstly as a longer dress, then as a mini dress and finally as a top. How cool is that? Owlie McPillowpants. Too cute - enough said. ...Amy! Here is Amy getting it on with the Unicorn at Spring 2010 quilt Market. Before you read on (if you don't mind) could you please pop over to The Breast Cancer Site, and click on the big pink button? It's very quick, there's no forms etc. you just click on the button and in doing so you are getting the sponsors of that site to pay for free mammograms to help women in need. Ta! It's a sad truth that at some point in our lives there is a chance that Breast Cancer will affect us either directly or indirectly. I must admit it helps with Al being a doc - he's always on at me to check my booobles. Janome UK are donating £10,000 to the Breast Cancer Campaign. To help fund this donation Janome has styled of one of their popular models with the well-known Pink Ribbon symbol. The sales of this machine will help go toward the donation fund. The Janome BCC-30 A great sewing machine dedicated to a great cause. The cool thing is...I've actually already used and reviewed this machine. It's the very same machine, but with a fresh new (Pink Ribbon) lick of paint. After I posted the machine review folks wrote in to say they already own the machine or they saw the review and bought the machine - and all are having a great time using it! Here are some USA Amazon reviews of the machine (known as Magnolia in the States). So if you happen to be in the market for a sewing machine or you are looking to upgrade; the Janome BCC-30 is well worth considering because it's honestly a cracking sewing machine and it has the added benefit of being charitable too - good sewing vibes all round methinks! Do you remember this Big n' Beautiful Betty Bag? If you like her, but you don't fancy making one for yourself how about treating yourself to the OOAK original Betty (as pictured above). All proceeds of the sale got to Breast Cancer Care. Ta! 3 CLOTH mags up for grabs! On the cover. I like the funky edgy look. Tasty sewing machine reviews. I wonder if we drool over sewing machines like (some) blokes drool over cars? Duuhh! Yes of course we do! ...whoa! There we have it, one hot Mama! Quick and cool ideas for zhushing up clothes and accessories with lace. Tell us what your fave sewing magazines are. If you don't have any, what are your fave craft books? If you could include the mag/book links that would be great so we can go check 'em out. I'll randomly select the 3 winners in 4 days time - 24th May and announce them the following day-ish. Good luck! But never mind there's always lots of nice crafty stuff to keep us busy inside the house. I for one have a bag book photography shoot list (as long as a bus) to prepare for. For anyone wondering, a photography shoot list is a list of instructions as to what needs photographing. My lovely publishers have been very generous with the amount of photos allocated to my book. Lots of pics will make life sooooooo much easier for all readers - but will amount to lots of photo prep work for me :( That's why you don't always get a ton of step by step photos in craft books; they take a lot of time, work, and they cost. I'm lucky that my editor is a craft fiend who agrees that photography really helps clarify text instructions. Anyways, whilst I get on with fabric cutting for the book (ohh just wait until you see the fabrics!) here's a super sneaky peek inside Wendy Mullin's (of Sew-U) Built by Wendy: Dresses book - it's not even in the shops yet! 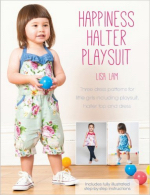 The book is spiral bound and comes with full sized pattern pieces, from which you can sew 25 different dresses. The pattern pieces are actually for 3 different dress shapes: (left to right) Shift, Sheath, and a Dirndl all of which can be modified to make up 25 dresses (or more - as your imagination allows). Dress sizes covered are: Bust 32" thru to 41"; waist 25" thru to 34"; and hip 35" thru to 44". Suggestions for modifying sleeves, also included are necklines, collars, and hem lengths. How to modify pattern and clothes to better fit your body. I find this section most useful because (I'm a short stuff and) it's always easier to gain dressmaking confidence from modifying shop bought clothing before you take the plunge and start from scratch. One of the pretty summer dress you can make. The following 2 photos are the pattern altering, layout, and sewing instruction for the above dress. All of the projects are laid out in this way: options are given for altering the pattern to you (if necessary), then you are shown how to lay out the fabric, and finally you are shown how to sew up the dress. ALSO there is an alternative suggestion provided for each dress (which is really nice touch I think). Some of the dirndl shape dresses you can make. Love the yellow one in the middle! Also love this dress too. The next 2 pics relate to the dress above. My verdict of Built by Wendy; Dresses. I love this book! I haven't yet looked at her other 2 titles, but I think on the strength of this book I'll check out her Stretch book. Wendy has a clear and friendly writing style. The plentiful line diagrams are as clear as day. The book is written to be instructive (which it really is!) but she also peppers her instructions with lots of cool suggestions. Included is a whole heap of useful dressmaking information and tips (more than than I could ever blog about). 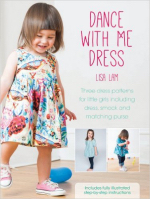 I think a beginning sewist could pick up this book and make themselves a simple but striking dress. More experienced sewists can explore the finer details of getting the perfect fit and playing around with collars, sleeves and so on. Yep, this book is well written, inspiring, and great value for money. One to pop into the wish-list methinks! Have you folks seen Wendy's other books or sewn with her patterns? What do you think of them? Free & Easy Stitch Style. Sneak Peek (& giveaway to be announced). Ohhh Kay! Here's another prize that is being added to the U-Handblog End of Year draw in which 1st prize is a smashing Janome sewing machine. The draw opens tomorrow!! 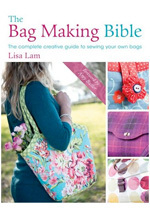 This book is 1 of 2 just published craft books that we are giving away! Both books are published by David & Charles - the same folks who are publishing my tome. The 2nd book to be given away is reviewed here. Here we have a fun and breezy craft title on free hand and free style machine sewing - literally doodling with your sewing machine. I have to say 'doodling around' looks very appealing especially as I spend all of my time sewing accurate seam allowances and neatly up matching up edges. In the book Poppy Treffry encourages you to do away with the neatness and 'colour over the lines'. For those who haven't tried it before there is a clear and good introduction into freestyle machine embroidery and whilst Poppy provides lots of inspiration and advice she encourages you to throw caution to the wind and dive in. I like it when there's no right or wrong in something. Poppy Treffry's new book: Free & Easy Stitch Style. How cute is this self portrait? Can never scoff look at too many cup cakes. Housey door stops. Loads of fun templates are provided at the back of the book. Sweet pleated bag with happy flowers. I love this version of a wall tidy. It's so vibrant. Coming tomorrow: the U-Handbag End of year draw. It's a BIG 'un you don't wanna miss it!! The Sewing Bible: Curtains. Sneak Peek (& giveaway to be announced). First up we have a clearly written book on curtains and window treatments. It's written by Wendy Gardiner who is the chief editor of Sewing World Magazine (the magazine I usually write for - when I don't have books to write). So rest assured that Wendy knows a sewing thing or two about a sewing thing or two! With bespoke curtains costing squillions (and shop bought not always coming up to the mark) why not make your own. My Mum does (Hi Mum!) and she always makes fab matching cushions too. With a fresh clean look, the 144 pages will explain many of the most difficult parts of curtain production in a clear, no nonsense way. Take one window, add a sewing machine, throw in some fabric, mix well.... it's curtains for the days when you didn't know how to make curtains! Love the art deco fabric on this swish looking window treatment. These modern looking eyelet curtains are reversible. Cool eh? I'd love to have round windows in my house! Graceful country style pinch pleat curtains. This fabulous sewing machine (and it is fabulous!) is going to be 1st prize in the End of Year U-Handblog draw, which opens on the 2nd Dec. 09. There are other tasty prizes that need their own review blog posts. So to prevent blog post clutter I am reviewing everything separately before chucking the whole yummy lot into one contest post on the 2nd Dec.
Yep, this has to be the most mega of mega-ist draws I've ever had the pleasure of holding. It couldn't have come better time. I know that lots of folks will be gifting or receiving sewing machines this end of year holiday (can't bring myself to say it!). 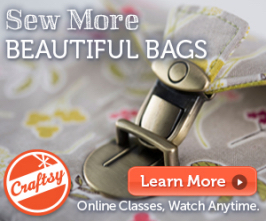 And I still get asked which sewing machine I recommend for bag making. Before I start: Janome is not paying me for this review. I never ever do paid reviews. I asked Janome to recommend a selection of models that a beginning sewer could use to make bags (i.e. a machine that is simple to get to grips with and could handle nightmare bag making layers). So I chose this one. It's no secret that I heart Janome machines (I've been banging on about how great they are for years). When Janome offered me a machine to review and giveaway it was a no-brainer because I love 'em! Please know that I wouldn't sing this machine's praises unless I genuinely loved it. A sewing machine is an investment purchase, I would never lead anyone up the garden path with something sew important. (known as Magnolia: 7730 in the US; and DC3030 in Europe). It is a great machine for beginners and proficient sewers alike. Computerised, easy to select stitches. The stitch selected goes to the default settings, no need to remember stitch width/length just touch the button! Lock stitch: saves lots of time finishing off loose ends. Drop Needle facility: if you begin sewing with the needle in the down position inserted in the fabric it will remain down for you to pivot your work when turning corners etc. Freearm: for all those awkward little places. You'll find that Janomes are built really well and they just keep on going - I've owned 3 Janome's and used 5. My sister has my first ever Janome (from around '99) and it's never needed a service! Check out the full specs here (the Magnolia 7730 and the 8077 are both the same). Check out the international site. Check out the UK site. Check out Kirstie Allsopp (yeah! I know!) with her Janome. If you can't wait for the draw (or you are a very nice person looking for a tasty sewing pressie). This machine is currently on offer in the UK & USA until 19th December. Promo UK price = £330 £279 (I've seen it for £249 online - flipping ace value for money!). In the US this model called the Magnolia 7730 and it has sunny flowers on it. Out of the box: sewing machine, metal foot pedal a power lead, soft dust cover, manual, and sewing notions. The machine has a sturdy feel and build quality, and it is a good solid weight (I don't like lightweight machines because everything jjjjuuuderrers when you are sewing at great speeds). The machine has a fresh, clean, and uncluttered look (thanks to the clever selector button and LCD (more about that in a minute). Part of the sewing bed detaches from the machine leaving you with a free-arm. As a bag maker I LOVE LOVE LOVE free-arms because they enable me to more easily sew the nooks and crannies of bags and smaller purses. Free arms also make arm-hole sewing a whole lot easier. Notions: 3 machine feet, a button hole machine foot, needles, bobbins, screw driver, reel holder, and your best friend and mine; a seam ripper. The 8077 has 30 stitches - more than enough for the sewing enthusiast. See that button I am pressing? It's a very clever selector button for the type of stitch, the stitch width, and stitch length. As you select the stitch/width/length the changes you make are displayed on the LCD. I like the selector button; it makes sense and it makes for a less cluttered looking machine. Don't worry, all is explained clearly in the manual. Bobbin all wound and ready to sew. Method of winding bobbin is printed onto the machine and in the manual. The 4 buttons on left are very handy indeed: from top: needle up/down; locking stitch; reverse button, and lastly a 'stop/start' button which enable you to sew without using the foot pedal - groovy eh? The slider switch to the (right of the photo) is a speed control which you can use to control the speed of the pedal and also the 'stop/start'. Yeah uh huh, but can it handle nightmare bag making style-y layers? Yup, it eats layers for breakfast, lunch, and dinner. In this pic the machine is merrily sewing though an utter nightmare layer-tastic scenario - namely: 2 layers of home dec fabric, 2 layers of fleece, and 2 layers of Flexi-firm - that's 6 thicko layers!!! The machine stitched through all 6 layers smoothly, quickly, and without argument. That's impressive! OK Al over to you. "Yes love I know you're tired after your night shift, but it's for a very good cause, and this could benefit others...". So bleary eyed (and understandably grumpy) Al was able to thread the machine, insert the bobbin, draw up the thread, and stitch the 3 lines of decorative stitches with only the manual (and a little encouragement from wifey). The stitches are nice, even, and consistent. He sews flipping straight doesn't he? His stitches are nimble in hospital too. I sewed the curved ended button hole - didn't want to push my luck with him too much. How to sew a button hole. There are 4 button hole styles to choose from and they are honestly easier than making a cuppa. You just put your foot on the pedal and the machine does it all and then stops automatically, no need to start and stop and reposition. Very simple, pretty, and satisfying. The manual is very clearly and plainly written and there are also plenty of clear line drawings. It assumes no sewing experience so a newbie who has never touched a sewing machine can get sewing pretty pronto. This is important because sewing machines do look kinda scary if you haven't played on one before. If you can get it right 1st, 2nd or even 3rd time there's more of a chance that you'll get the sewing bug - which is a very nice bug to have! A user friendly sewing machine manual can be all the difference between "happy handmade heaven" and "throw the bloody thing out of the window...ahh!!! I need to kick something!" If you want a decent quality sewing machine that: is simple to get to grips with; has a host of useful (rather than 'am I ever going to need that' sort of) features; and will happily be your sewing gal for many years to come than I can whole heartedly recommend the 8077. 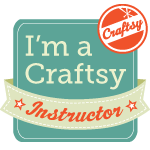 Coming tomorrow: 2 fab craft titles for review & giveaway.